Nelson Bryant, 92, at home in West Tisbury. For years he was the outdoor columnist for the New York Times. Nelson Bryant remembers playing marbles under a giant maple tree near the West Tisbury town hall, fishing for trout with a childhood friend in Mill Pond and trapping muskrats for his neighbors for a dollar apiece. For Mr. Bryant, who first came to the Vineyard in 1932, his surroundings are an ever-present reminder of days gone by. Approaching his 90th birthday two years ago, he began writing his memoir, Mill Pond Joe, which chronicles his early years on the Vineyard, his many near-death experiences during World War II, his career as a newspaper editor in New Hampshire and Massachusetts, and 30 years as outdoors columnist for the New York Times, among other experiences. The memoir was released in September. Part of Mr. Bryant’s intention, he said, was to show what the Vineyard was like 80 years ago, when residents were far fewer and wildlife was more abundant. 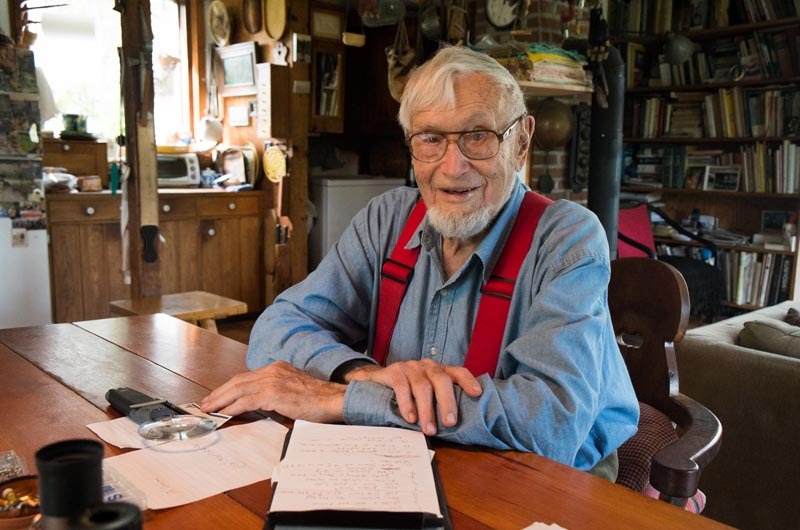 In West Tisbury alone, he writes, the year-round population swelled from 270 in 1930 to just over 3,000 in 2013. The Island’s year-round population increased from about 5,000 to over 17,000 in the same period. Mr. Bryant doesn't just write about the outdoors, he lives it. Mr. Bryant’s home is nestled among beetlebung and apple trees behind the house where he grew up. Nearly every wall is covered with photographs and paintings, including woodcuts by his partner, Ruth Kirchmeier, who bought the house years ago with her former husband, Rolf Ohlhausen. A sketch by Island artist Stanley Murphy shows Mr. Bryant in a beret with arms folded and eyebrows raised, looking like a younger Marlon Brando. A large spice rack in the kitchen betrays the couple’s love of cooking. “She does the pies and cakes and the esoteric European recipes,” Mr. Bryant said. (Ms. Kirchmeier’s parents immigrated from Bavaria.) “I cook all of the wild game and the fish. He looks forward to hunting every year, but not the “hundreds of people going through the woods screaming and yelling and shooting.” He opts instead for antique muzzle-loading season in December. “There are only a few who are willing to discipline themselves to use this type [of weapon], so I hunt during that period,” he said. A spot on Mill Pond called Stepping Stones, where he first fished for trout with his friend Albion (Little Beanie) Alley, “has become a symbol of the birth of my rural pleasures,” he writes in his memoir. 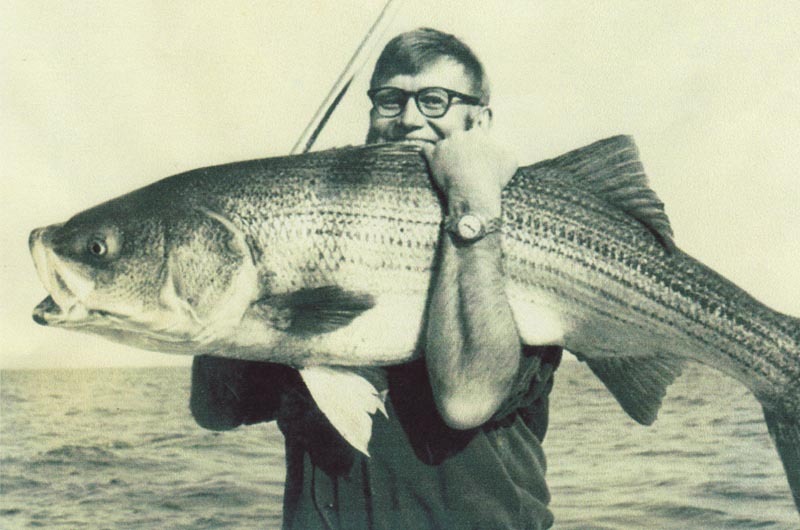 He also recalls surfcasting for bluefish and striped bass with his father in the 1930s using a long, tarred line attached to a cedar shingle stuck in the sand. He later upgraded to a simple rod and reel. His adventures as a young boy were the subject of bedtime stories he told his children, through the eyes of a fictional character he called Mill Pond Joe. But committing the stories to print was a new experience. While recalling simpler days, Mr. Bryant also takes a hard, honest look at his personal shortcomings over the years, revealing a life lived fully, if imperfectly. “It’s rambling, but I did that kind of deliberately,” he said. The rambling it does is the best kind, luring the reader in like a fish on a long line. Mr. Bryant’s appetite for life runs deep. But as he admits in the memoir, it has gotten out of hand at times. He writes candidly about a 10-year love affair that contributed to the end of his first marriage after more than 43 years, and other regrets. “A memoir is a difficult thing,” he said. “How much are you going to reveal?” In the end, he decided to change the names of his extramarital partners (there were three, in addition to shorter “flings”), although all have died. The joys outnumber the sorrows in the memoir, but the sorrows are especially poignant. From his brushes with death during the war to his recollection of childhood antics, Mr. Bryant writes with the candor of a seasoned journalist and the imagination of a poet. Soon after taking a small town in Germany during the Battle of the Bulge, his group came under fire from a lone machine-gunner. “Fingers of lead were plucking at my overcoat and gear,” he writes, and he dove into the snow with a fellow trooper. Miraculously, he was saved from serious injury by a metal container in his back pocket. After the war, Mr. Bryant spent more than a decade as a managing editor — first at the Daily Eagle in New Hampshire and then at the Gloucester Times in Massachusetts. His career as outdoors columnist for the New York Times produced two published volumes — in 1971 and 1990. But journalism was also a great source of fulfillment. In the final chapter, he writes of the comfort, in old age, of sharing his life and stories with friends and loved ones. At age 92, Mr. Bryant still enjoys the outdoors intensely, although at a slower pace. He and Ms. Kirchmeier gather oysters in Tisbury Great Pond in the fall, or paddle along for a couple of miles, admiring the plants and birds along the shore, or stopping a while to fish for white perch. From time to time, Mr. Bryant will get out his .22 rifle and shoot a white-tailed rabbit in his backyard, where he and Ms. Kirchmeier tend flowers, vegetables, fruit trees and other plants. He noted that one apple tree, now tall and moss-covered, was a gift from an ex-girlfriend about 20 years ago. Never met the man but having followed his works I have always considered him a friend. Somehow about fifteen years ago I became an occasional pen pal with Nelson. After years of reading his NY Times missives I treasured those few letters. I grew up on Long Island when my friends and I could ride our bicycles to fish and rent boats and otherwise carouse in Cold Spring Harbor, about ten miles east. We were ten or twelve years old and loved the sense of adventure and freedom. To read Nelson Bryant's description of life in nature on Marthas Vineyard had me year for those childhood days. I screwed up my courage and wrote to Nelson about 2001. He was also a Dartmouth man and I was keen to fish stripers. Cathy and I became fast friends with Nelson and Ruth, both of them remarkable people. We treasure our time with them. I have followed Nelson Bryant for years in the NY Times and have enjoyed vicariously his many adventures in the outdoors. As an avid fly fisherman and bird hunter in the US, Canada, Bahamas and in Scotland, Nelson was/is a kindred soul. He continues to impress me. A life well lived.